The information below provides answers to questions frequently asked of Feinberg IT staff. You’ll also find links to additional information when available. You can find more information on NUIT Knowledge Base. How often is my Feinberg computer operating system updated? Windows updates are pushed once a month after extensive system testing. Mac updates are released after system testing can be completed. Individual users can install these when they are ready to upgrade. How often are base models updated? New PC models are usually available in March, while Mac computers are typically released in September. How often is my Feinberg computer updated (3rd party software updates)? Updates happen automatically after release and employees do not need to take any action if they are on managed machines. If your computer is notifying you of an update that has not been performed, please contact fsmhelp@northwestern.edu for more information. What "client management" software are you installing on my computer? Feinberg IT installs Dell Kace (Windows) or Casper (Apple) software on all Feinberg-owned computers. This enables Feinberg IT to inventory and update the computers. What is the Qualys software installed on my computer? The Qualys agent is one of the standard security tools included on all computers managed by Feinberg IT. Qualys looks for missing security-related updates and settings, to assist in ensuring your devices are protected from attackers. The Qualys agent provides security reporting information only and does not examine your personal data or control your computer. My computer has a virus, what do I do? Send an email to fsmhelp@northwestern.edu, or call 1-HELP (Option 5). A Feinberg IT technician will review options to remove the virus from your computer. Go to NU Validate and follow the prompts. If you forgot your password, select “Forgot Password” to answer your security questions. NUIT offers guidelines about creating a strong password/passphrase. Is my computer being backed up? Feinberg has licensing for CrashPlan to back up all our computers. Email Feinberg IT if you need to confirm this service. Where should I store my data? What are these drives? Computers managed by FSM IT are to include the following drives. You cannot store NU data on personal computers. How do I add a printer on my computer? Contact the help desk. We’ll ask you to provide information about the printer to which you wish to connect, including location (building, floor, room) and any label information, if available. How do I track my IT support request? Please log on to itsm.northwestern.edu, and select the “Home” tab to view your requests. What is considered a Feinberg device and what is personal? Anything purchased through the University, including equipment paid for through grant funding, and items purchased with PI accounts, are property of Northwestern University. Personal devices, such as mobile phones and tablets purchased by a faculty or staff member, can be used to access email or other Northwestern tools, but remain the property and responsibility of that individual. Please note: personal devices will need to be secured prior to connecting with Northwestern tools or servers. I would like a website for my project/lab. Can you help me build and host it? The Office of Communications can help assess your department/center/program/lab web presence and guide you through the website creation process. Please submit a Communication’s Project Request Form to begin the process. How do I access my NU email? You can access the web client (Outlook Web App) on any computer. Feinberg IT can configure an email program, such as Outlook, if you are using a Feinberg managed computer. I also have a Northwestern Medicine email account. How do I access my NM email? You can access the NM Outlook Web App. 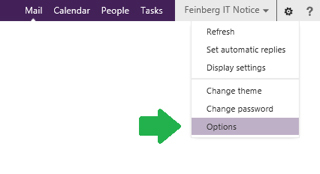 NMIT can configure Outlook on your NMHC computer. Eligible devices must use WPA2 Enterprise security. If your device does not leverage WPA2 Enterprise connection it cannot connect to the NU network. Can I auto-forward work emails to my home email rather than going through the Outlook Web app? No. Feinberg IT has a number of email policies related to unintended sharing of protected health information (PHI) and personally identifiable information (PII). Email messages and attachments can be forwarded and/or auto-forwarded only within approved Northwestern-affiliated email systems. I am buying a new personal mobile device on which I want to check my work email. What should I get? You will need to set up a security passcode when you set up your Northwestern email on your device. To ensure your chosen mobile device will suit your work needs, reference the mobile device overview table available via the NUIT site. Use your Wildcard to receive discounts on a number of mobile services. 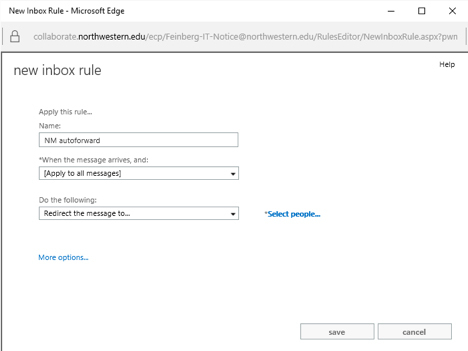 Please review the “Email Auto-forwarding Policy” for approved Northwestern-affiliated email systems. Another window will appear to record the destination email address. Type the email address you want all email to be sent – example@nm.org below. Once entered click “OK”. You are done! All email sent to your @northwestern.edu address will now be auto-forwarded to your NM family email address. If you need assistance or have any questions, please contact us at: fsmhelp@northwestern.edu. I’ve gotten another job and I’m leaving the University. What do I do with my computer and accessories prior to my departure? Talk to your supervisor or Department Administrator about a proper off-boarding plan for Feinberg hardware and data on the computer that you use. Supervisors and Department Administrators should advise staff and faculty to back up their data to the appropriate FSM unit's shared folder prior to leaving so other team members can access that information. When the hardware is reconfigured for a new faculty or staff member, all data will be removed. If you are a Principal Investigator (PI) who wishes to take Feinberg-owned research data to another institution, you will need to connect with the Office of Sponsored Research about establishing a Data Usage Agreement. I have a new staff member starting next month. How do I get them started with a new computer? Contact the help desk to get the process started with Feinberg IT’s Procurement Team. Onboarding and deployment of devices that are already in stock typically takes three to five business days. Specialized devices may require more turnaround time. The Procurement Team will give you a projected timeline when you order. Here is a link to the purchasing page for more information. I have a new staff member starting next month. How do I get them set up with a computer another employee was using previously? Contact the help desk even if you have computer equipment for your new staff member. Feinberg IT will need to set up the computer and server access for the new user. I’m getting a new computer. How do I make sure my files, programs, and settings will be transferred? The Feinberg IT technician delivering and setting up the computer will go through this Computer Deployment Checklist with you to make sure everything is transferred and configured on your new computer. What does it mean for my PC or Mac computer to be managed? Sometimes, the benefits of having a fully managed device are not immediately visible, but some of the key benefits are improved security and compliance, decreased downtime, reduced risk and better resource sharing and decreased IT costs. We are asked by faculty and staff “Why does my computer need to be managed? I don’t want someone controlling my computer.” We understand that having anyone else do anything to your computer feels like a loss of control. Stating that it is University or Feinberg policy to have managed computers does not make anyone feel better or create a level of trust that is needed for the managed system to work. We hope that our explanation helps faculty and staff understand and appreciate why a managed computer is better for individuals and the collective good of all who use the campus network. A managed computer in the Feinberg environment means that the device has our endpoint management software installed, the device is encrypted using either Bitlocker (PC) or Filevault (Mac) and FSM’s Symantec anti-virus is installed. A managed computer provides the average user with more control over the physical device and the contents on that device. This is done by connecting the computer to a system which provides access to the resources such as files and printers, that are available locally and, on the network, and manages who has access to those resources. On a Mac device, there is a Self-Service portal provided by JAMF, which allows users to install our more commonly used software packages and also provides tools and updates. Likewise, PC’s use a system called BigFix, which also provides computers with security updates and the ability to install approved software. To learn what JAMF and Bigfix can do for you, please go to our knowledge base: https://kb.northwestern.edu/page.php?id=77462 or call us at 847-591-HELP (3457) option 5. Can I upgrade my work computer? Contact the help desk and Feinberg IT’s Procurement Team can walk you through the assessment process to determine your needs and budget. You may also submit a completed Assessment Form, and Feinberg IT staff will follow up with you. Where do I see the Feinberg computer hardware standards? The University has set hardware and software standards, as well as bundles and computers that comply with those standards. How do I purchase a computer and how long does it take? Once received, standard devices that are already in stock typically take three to five business days to be configured and deployed to you. Apple products will take approximately 2 weeks to arrive, after the order is approved by your department. Customized devices will require more turnaround time. Please allow 3-5 weeks to receive your machine based on availability of parts. Can I purchase hardware without Feinberg IT if I use funds from a grant-funded research? No. You must use Feinberg IT to purchase your items as you would have without grant funds. In addition, the hardware or software should be itemized on your grant submission and budget justification document provided to the Office of Sponsored Research. In order for Feinberg IT to purchase items from grant funds, OSR must have signed off on the purchase. Can I purchase hardware myself? Please see the purchasing section of our site for more information about what can and cannot be purchased outside of our purchasing group. Feinberg IT will not support or network hardware or install software that is not purchased through the proper channels. To address immediate needs of faculty and staff, Feinberg IT allows the purchase of many accessories outside of our internal process. Can I purchase software myself? Generally yes, but before you purchase software, connect with Galter Library and contact us to inquire about the availability of the computer programs you are seeking. Through institutional licensening agreements and existing licenses, they are likely available at a reduced rate or even free. Can I return my Apple device? Apple does not allow returns for items purchased by Northwestern University. Can I purchase hardware on my credit card or procurement card? No, please see the purchasing section for more details. Can I return my PC? Yes, under some circumstances your Lenovo machine can be returned, but you will likely pay a restocking fee. Data that is encrypted is not considered protected health information (PHI) or personally identifiable information (PII) as defined by the regulations. Data on devices that are verifiably encrypted and become lost or stolen are not reportable events to regulatory agencies. FSM has established the policy that all devices must be encrypted. The FSM Information Security & Access Policy has more information. What should I do if my device is lost or stolen or data has been inappropriately disclosed? The loss must be reported immediately to FSM IT at fsmhelp@northwestern.edu. Who do I contact with questions about information security policy? Please contact the Information Security Team at FSMIT-Policy@northwestern.edu. When is a data security plan required? A data security plan is required to be completed when the principle investigator has an FSM appointment. This is a requirement regardless of the type of data being used in the research project. How do I secure the data in my clinical research? Please refer to our information security, email and data security plan policies. Am I allowed to store NU data on my personal devices? No non-public NU data (e.g., research, healthcare/clinical, student data) will be permitted to be stored on mobile and personal devices, unless they are FSM IT managed devices. Can I share clinical research data via Northwestern Box? Northwestern Box is not yet approved for storage of clinical research data. As Northwestern Box is approved for additional use cases an announcement will be made. Please refer to current secure file sharing at Northwestern and FSM storage options. How can I safely electronically share PHI or PII information with my colleagues? Secure email and file sharing at Northwestern and FSM storage options are available. How do I backup my data securely? FSM IT provides services to backup data securely. Please contact fsmhelp@northwestern.edu to determine the best backup options for your needs. How do I engage commercial vendors for use in research? The use of commercial vendors for use in research must have a written agreement between NU and the vendor including written approval from the FSM Dean’s office. In addition, NU policy for vetting commercial vendors must be followed. How do I report a suspected policy violation? Please contact the Information Security Team at FSMIT-Policy@northwestern.edu. To anonymously report, please refer to the Northwestern University EthicsPoint contact information. How do I access work email from my home computer? How do I get administrator rights to my computer? Complete and submit the Computer Administrator Rights form to begin the process. Can I get help recording my presentation/event/conference? Feinberg IT’s Integrated Media Services group can assist with multimedia recording and hosting needs. Learn about their available services. How do I know which video-conferencing application to request for our upcoming event? Media Services will help you make the best decision. Contact the help desk to connect with them. Learn about their available services. How far in advance should we request services? Most events require notice of one week for scheduling, set up and testing. Special events with more than one remote site viewing a broadcast, or where clinical content from the OR or Labs are involved, require a minimum of one month. How should we request services? Please open a ticket with the Feinberg IT Help Desk. Media Services will respond within 24 hours. Do I need to make a separate room reservation when using Media Services? Yes. Having a room held does not necessarily mean that there will be someone there to help. Be sure to open a ticket with the Help Desk. Yes. If your event takes place in a NMH location (e.g., Arkes, Feinberg, Lavin, or Galter), you will need to make a separate room reservation with the NMHC Conference Center or the clinical department managing the room. Media Services cannot hold space in NMHS, but it can help you with the reservation process. Can Media Services assist me with broadcasting medical procedures? Media Services provides educational broadcast services to properly authorized individuals and groups for broadcasts originating from clinical services, such as OR procedures, catheter and EP lab events, and GI lab procedures. Content varies by location, but most commonly includes field, scope, instrument and other relevant capture.